Weve designed a safe and amazingly soft electric mattress pad that not only warms your bed, but also protects it. The waterproof 233 thread-count 80 poly/20 cotton dobby stripe decorative shell is incredibly soft and soothing. A special TPU Laminate waterproof barrier and Stain Repellent Scotchgard Finish protects against spills and accidents of ALL types, but that’s just a couple of the wonderful features of this pad. Constructed within the pad is the patented Safe & Warm low-voltage technology. This low-voltage mattress pad includes a small power supply box that changes 120 volt AC home current into non-hazardous low voltage DC current (very similar to a battery) to provide warmth, protection and safety even if the pad becomes wet. Unlike other warming pads with their thick bulky wires, the heating wires in the Soft Heat pads are so small, they are virtually unnoticeable. During construction we place the ultra thin wires 3-inches apart and evenly distribute them from head to toe. The benefit to you is a pad that gives more of an even heat and has no annoying hot or cold spots. The full size pad comes standard with one easy to read, easy to turn, non-slip computerized controller to adjust the temperature of the pad. For cozy sheets before bed time, it has an automatic pre-heat and hold feature. You simply turn it on and the pad will warm up on HI until it reaches the temperature that you pre set your dial on, and then adjusts itself to hold it there. For your safety convenience and power conservation, it has an automatic shut off feature that will shut the pad off after 10 hours just in case you forget. It also comes standard with built in over-temperature protection for that extra bit of safety and peace of mind. On the controller, a giant backlit display with auto dimming feature provides more convenience for night time adjustments with out having to turn on the lights. A fitted skirt keeps it all in place. Easy care machine wash and tumble dry. Weve designed a safe and incredibly soft electric mattress pad that not only warms your bed, but also rejuvenates it. Due to the all over penetrating warmth of this low-voltage mattress pad, youll start saving money on your energy bill while lowering your thermostat. The 233 thread-count 80 poly/20 cotton dobby stripe shell is incredibly soft, soothing and supportive. Constructed within the pad is the patented Safe & Warm low-voltage technology. This low-voltage mattress pad includes a small power supply box that changes 120 volt AC home current into non-hazardous low voltage DC current (very similar to a battery) to provide warmth, protection and safety even if the pad becomes wet. Unlike other warming pads with their thick bulky wires, the heating wires in the Soft Heat pads are so small, they are virtually unnoticeable. During construction we place the ultra thin wires 3-inches apart and evenly distribute them from head to toe. The benefit to you is a pad that gives more of an even heat and has no annoying hot or cold spots. The king size pad is divided in two separate zones and comes standard with two easy to read, easy to turn, non-slip computerized controllers to adjust the temperature of each side of the bed giving individual comfort and control. For cozy sheets before bed time, it has an automatic pre-heat and hold feature. You simply turn it on and the pad will warm up on HI until it reaches the temperature that you pre set your dial on, and then adjusts itself to hold it there. For your safety convenience and power conservation, it has an automatic shut off feature that will shut the pad off after 10 hours just in case you forget. It also comes standard with built in over-temperature protection for that extra bit of safety and peace of mind. On the controller, a giant backlit display with auto dimming feature provides more convenience for night time adjustments with out having to turn on the lights. A fitted skirt keeps it all in place.This warming product has been designed to provide you a gentle relaxing heat. It will NOT feel warm to the touch of your hand, even on the highest (HI) setting.You must actually use it to experience the cozy warmth that it will generate.If the control lamp is lit, it is working. We suggest you start at the HI setting for the first use and then adjust down to your personal comfort level. To receive the most pleasure from your warming product, read your User Manual.This warming product has been designed to provide you a gentle relaxing heat. It will NOT feel warm to the touch of your hand, even on the highest (HI) setting.You must actually use it to experience the cozy warmth that it will generate.If the control lamp is lit, it is working. We suggest you start at the HI setting for the first use and then adjust down to your personal comfort level. To receive the most pleasure from your warming product, read your User Manual. Weve designed a safe and incredibly soft electric blanket that is probably one of the most comfortable blankets you’ll ever have the luxury of snuggling up in. This electric blanket starts with super soft micro-plush fabric and decorative triple-ribbed design that is refreshingly smooth next to your skin for the ultimate in luxurious comfort. Constructed within the blanket is the patented Safe & Warm low-voltage technology. This low-voltage blanket includes a small power supply box that changes 120 volt AC home current into non-hazardous low voltage DC current (very similar to a battery) to provide warmth, protection and safety even if the blanket becomes wet. Unlike other warming blankets with their thick bulky wires, the wires in the Soft Heat blankets are so small and thin; they are virtually unnoticeable. During construction we place the thin wires 3-inches apart and evenly distribute them from head to toe. The benefit to you is a blanket that gives more of an even heat and all over penetrating warmth with no annoying hot or cold spots. 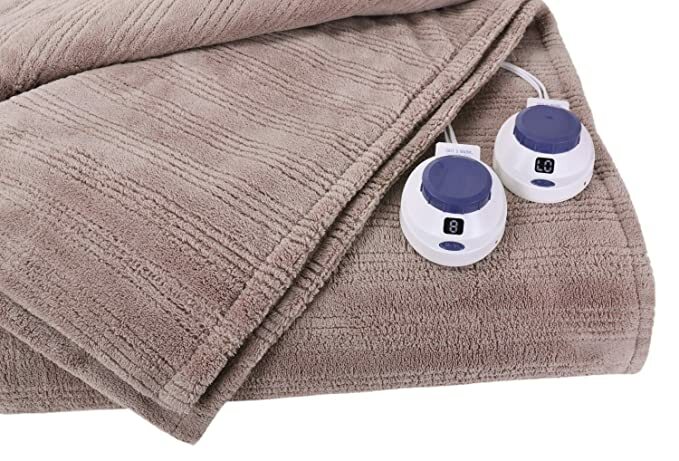 The twin size blanket comes standard with one easy to read, easy to turn, non-slip computerized controller to adjust the temperature of the blanket. A giant backlit display with auto dimming feature provides more convenience for night time adjustments without having to turn on the lights. It has an automatic pre-heat and hold feature that makes sure that your bed is warm and cozy before you climb in for the night. You simply turn it on and the blanket will warm up on HI until it reaches the temperature that you preset your dial on and then adjusts itself to hold it there. For your safety, convenience and power conservation it has an automatic shut off feature that will shut the blanket off after 10 hours just in case you forget. It also comes standard with built in over-temperature protection for that extra bit of safety and peace of mind.This warming product has been designed to provide you a gentle relaxing heat. It will NOT feel warm to the touch of your hand, even on the highest (HI) setting.You must actually use it to experience the cozy warmth that it will generate.If the control lamp is lit, it is working. We suggest you start at the HI setting for the first use and then adjust down to your personal comfort level. To receive the most pleasure from your warming product, read your User Manual.This warming product has been designed to provide you a gentle relaxing heat. It will NOT feel warm to the touch of your hand, even on the highest (HI) setting.You must actually use it to experience the cozy warmth that it will generate.If the control lamp is lit, it is working. We suggest you start at the HI setting for the first use and then adjust down to your personal comfort level. To receive the most pleasure from your warming product, read your User Manual. Weve designed a safe and incredibly soft electric mattress pad that not only warms your bed, but also rejuvenates it. Due to the all over penetrating warmth of this low-voltage mattress pad, youll start saving money on your energy bill while lowering your thermostat. The 233 thread-count 80 poly/20 cotton dobby stripe shell is incredibly soft, soothing and supportive. Constructed within the pad is the patented Safe & Warm low-voltage technology. This low-voltage mattress pad includes a small power supply box that changes 120 volt AC home current into non-hazardous low voltage DC current (very similar to a battery) to provide warmth, protection and safety even if the pad becomes wet. Unlike other warming pads with their thick bulky wires, the heating wires in the Soft Heat pads are so small, they are virtually unnoticeable. During construction we place the ultra thin wires 3-inches apart and evenly distribute them from head to toe. The benefit to you is a pad that gives more of an even heat and has no annoying hot or cold spots. The full size pad comes standard with one easy to read, easy to turn, non-slip computerized controller to adjust the temperature of the pad. For cozy sheets before bed time, it has an automatic pre-heat and hold feature. You simply turn it on and the pad will warm up on HI until it reaches the temperature that you pre set your dial on, and then adjusts itself to hold it there. For your safety convenience and power conservation, it has an automatic shut off feature that will shut the pad off after 10 hours just in case you forget. It also comes standard with built in over-temperature protection for that extra bit of safety and peace of mind. On the controller, a giant backlit display with auto dimming feature provides more convenience for night time adjustments with out having to turn on the lights. A fitted skirt keeps it all in place to eliminate shifting or bunching and promote better sheet fit. Easy care machine wash and tumble dry.This warming product has been designed to provide you a gentle relaxing heat. It will NOT feel warm to the touch of your hand, even on the highest (HI) setting.You must actually use it to experience the cozy warmth that it will generate.If the control lamp is lit, it is working. We suggest you start at the HI setting for the first use and then adjust down to your personal comfort level. To receive the most pleasure from your warming product, read your User Manual.This warming product has been designed to provide you a gentle relaxing heat. It will NOT feel warm to the touch of your hand, even on the highest (HI) setting.You must actually use it to experience the cozy warmth that it will generate.If the control lamp is lit, it is working. We suggest you start at the HI setting for the first use and then adjust down to your personal comfort level. To receive the most pleasure from your warming product, read your User Manual. Patented safe and warm low voltage technology is safer than others on the market; automatically shuts off after 10 hours for convenience and savings.This warming product has been designed to provide you a gentle relaxing heat. It will NOT feel warm to the touch of your hand, even on the highest (HI) setting.You must actually use it to experience the cozy warmth that it will generate.If the control lamp is lit, it is working. We suggest you start at the HI setting for the first use and then adjust down to your personal comfort level. To receive the most pleasure from your warming product, read your User Manual.This warming product has been designed to provide you a gentle relaxing heat. It will NOT feel warm to the touch of your hand, even on the highest (HI) setting.You must actually use it to experience the cozy warmth that it will generate.If the control lamp is lit, it is working. We suggest you start at the HI setting for the first use and then adjust down to your personal comfort level. To receive the most pleasure from your warming product, read your User Manual. Weve designed a safe and amazingly soft electric mattress pad that not only warms your bed, but also protects it. The waterproof 233 thread-count 80 poly/20 cotton dobby stripe decorative shell is incredibly soft and soothing. A special TPU Laminate waterproof barrier and Stain Repellent Scotchgard Finish protects against spills and accidents of ALL types, but that’s just a couple of the wonderful features of this pad. Constructed within the pad is the patented Safe & Warm low-voltage technology. This low-voltage mattress pad includes a small power supply box that changes 120 volt AC home current into non-hazardous low voltage DC current (very similar to a battery) to provide warmth, protection and safety even if the pad becomes wet. Unlike other warming pads with their thick bulky wires, the heating wires in the Soft Heat pads are so small, they are virtually unnoticeable. During construction we place the ultra thin wires 3-inches apart and evenly distribute them from head to toe. The benefit to you is a pad that gives more of an even heat and has no annoying hot or cold spots. 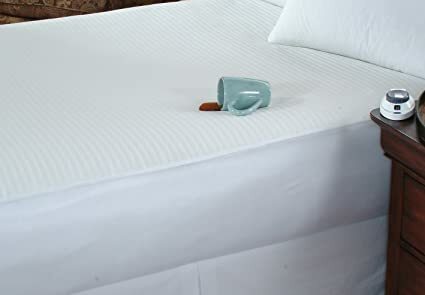 The queen size pad is divided in two separate zones and comes standard with two easy to read, easy to turn, non-slip computerized controllers to adjust the temperature of each side of the bed giving individual comfort and control. For cozy sheets before bed time, it has an automatic pre-heat and hold feature. You simply turn it on and the pad will warm up on HI until it reaches the temperature that you pre set your dial on, and then adjusts itself to hold it there. For your safety convenience and power conservation, it has an automatic shut off feature that will shut the pad off after 10 hours just in case you forget. It also comes standard with built in over-temperature protection for that extra bit of safety and peace of mind. On the controller, a giant backlit display with auto dimming feature provides more convenience for night time adjustments with out having to turn on the lights. Weve designed a safe and incredibly soft electric blanket that is probably one of the most comfortable blankets you’ll ever have the luxury of snuggling up in. 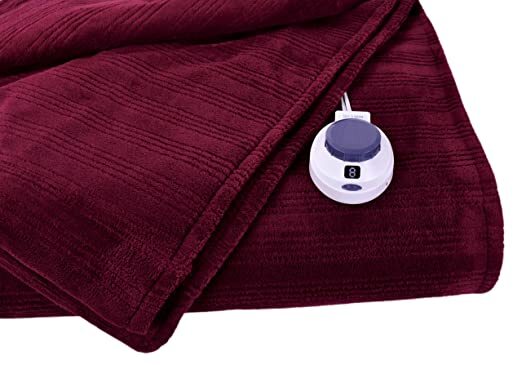 This electric blanket starts with super soft micro-plush fabric and decorative triple-ribbed design that is refreshingly smooth next to your skin for the ultimate in luxurious comfort. Constructed within the blanket is the patented Safe & Warm low-voltage technology. This low-voltage blanket includes a small power supply box that changes 120 volt AC home current into non-hazardous low voltage DC current (very similar to a battery) to provide warmth, protection and safety even if the blanket becomes wet. Unlike other warming blankets with their thick bulky wires, the wires in the Soft Heat blankets are so small and thin; they are virtually unnoticeable. During construction we place the thin wires 3-inches apart and evenly distribute them from head to toe. The benefit to you is a blanket that gives more of an even heat and all over penetrating warmth with no annoying hot or cold spots. The queen size blanket is divided in two separate zones and comes standard with two easy to read, easy to turn, non-slip computerized controllers to adjust the temperature of each side of the bed giving individual comfort and control. A giant backlit display with auto dimming feature provides more convenience for night time adjustments without having to turn on the lights. It has an automatic pre-heat and hold feature that makes sure that your bed is warm and cozy before you climb in for the night. You simply turn it on and the blanket will warm up on HI until it reaches the temperature that you preset your dial on and then adjusts itself to hold it there. For your safety, convenience and power conservation it has an automatic shut off feature that will shut the blanket off after 10 hours just in case you forget. It also comes standard with built in over-temperature protection for that extra bit of safety and peace of mind.This warming product has been designed to provide you a gentle relaxing heat. It will NOT feel warm to the touch of your hand, even on the highest (HI) setting.You must actually use it to experience the cozy warmth that it will generate.If the control lamp is lit, it is working. We suggest you start at the HI setting for the first use and then adjust down to your personal comfort level. To receive the most pleasure from your warming product, read your User Manual.This warming product has been designed to provide you a gentle relaxing heat. It will NOT feel warm to the touch of your hand, even on the highest (HI) setting.You must actually use it to experience the cozy warmth that it will generate.If the control lamp is lit, it is working. We suggest you start at the HI setting for the first use and then adjust down to your personal comfort level. To receive the most pleasure from your warming product, read your User Manual. 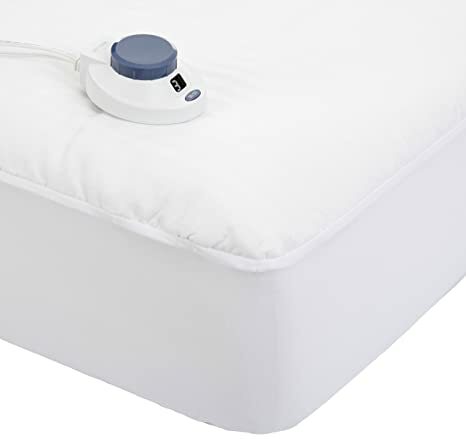 Weve designed a safe and incredibly soft electric mattress pad that not only warms your bed, but also rejuvenates it. Amazing is the best word to describe this ultra-plush pad with its incredibly soft, supportive and luxurious Micro-Velour fabric top. Due to the all over penetrating warmth of this low-voltage mattress pad, youll start saving money on your energy bill while lowering your thermostat. Constructed within the pad is the patented Safe & Warm low-voltage technology. This low-voltage mattress pad includes a small power supply box that changes 120 volt AC home current into non-hazardous low voltage DC current (very similar to a battery) to provide warmth, protection and safety even if the pad becomes wet. Unlike other warming pads with their thick bulky wires, the heating wires in the Soft Heat pads are so small, they are virtually unnoticeable. During construction we place the ultra thin wires 3-inches apart and evenly distribute them from head to toe. The benefit to you is a pad that gives more of an even heat and has no annoying hot or cold spots. The queen size pad is divided in two separate zones and comes standard with two easy to read, easy to turn, non-slip computerized controllers to adjust the temperature of each side of the bed giving individual comfort and control. For cozy sheets before bed time, it has an automatic pre-heat and hold feature. You simply turn it on and the pad will warm up on HI until it reaches the temperature that you pre set your dial on, and then adjusts itself to hold it there. For your safety convenience and power conservation, it has an automatic shut off feature that will shut the pad off after 10 hours just in case you forget. It also comes standard with built in over-temperature protection for that extra bit of safety and peace of mind. On the controller, a giant backlit display with auto dimming feature provides more convenience for night time adjustments with out having to turn on the lights.This warming product has been designed to provide you a gentle relaxing heat. It will NOT feel warm to the touch of your hand, even on the highest (HI) setting.You must actually use it to experience the cozy warmth that it will generate.If the control lamp is lit, it is working. We suggest you start at the HI setting for the first use and then adjust down to your personal comfort level. To receive the most pleasure from your warming product, read your User Manual.This warming product has been designed to provide you a gentle relaxing heat. It will NOT feel warm to the touch of your hand, even on the highest (HI) setting.You must actually use it to experience the cozy warmth that it will generate.If the control lamp is lit, it is working. We suggest you start at the HI setting for the first use and then adjust down to your personal comfort level. To receive the most pleasure from your warming product, read your User Manual. Weve designed a safe and incredibly soft electric blanket that is probably one of the most comfortable blankets you’ll ever have the luxury of snuggling up in. 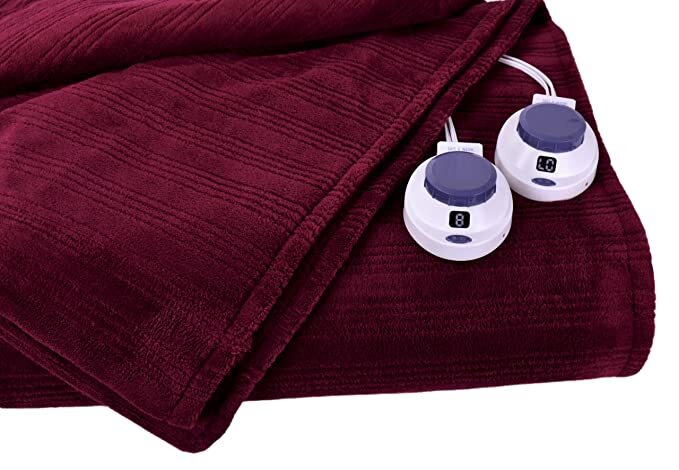 This electric blanket starts with super soft micro-plush fabric that is refreshingly smooth next to your skin for the ultimate in luxurious comfort. Constructed within the blanket is the patented Safe & Warm low-voltage technology. This low-voltage blanket includes a small power supply box that changes 120 volt AC home current into non-hazardous low voltage DC current (very similar to a battery) to provide warmth, protection and safety even if the blanket becomes wet. Unlike other warming blankets with their thick bulky wires, the wires in the Soft Heat blankets are so small and thin; they are virtually unnoticeable. During construction we place the thin wires 3-inches apart and evenly distribute them from head to toe. The benefit to you is a blanket that gives more of an even heat and all over penetrating warmth with no annoying hot or cold spots. The queen size blanket is divided in two separate zones and comes standard with two easy to read, easy to turn, non-slip computerized controllers to adjust the temperature of each side of the bed giving individual comfort and control. A giant backlit display with auto dimming feature provides more convenience for night time adjustments with out having to turn on the lights. It has an automatic pre-heat and hold feature that makes sure that your bed is warm and cozy before you climb in for the night. You simply turn it on and the blanket will warm up on HI until it reaches the temperature that you pre set your dial on and then adjusts itself to hold it there. For your safety, convenience and power conservation it has an automatic shut off feature that will shut the blanket off after 10 hours just in case you forget. It also comes standard with built in over-temperature protection for that extra bit of safety and peace of mind.This warming product has been designed to provide you a gentle relaxing heat. It will NOT feel warm to the touch of your hand, even on the highest (HI) setting.You must actually use it to experience the cozy warmth that it will generate.If the control lamp is lit, it is working. We suggest you start at the HI setting for the first use and then adjust down to your personal comfort level. To receive the most pleasure from your warming product, read your User Manual.This warming product has been designed to provide you a gentle relaxing heat. It will NOT feel warm to the touch of your hand, even on the highest (HI) setting.You must actually use it to experience the cozy warmth that it will generate.If the control lamp is lit, it is working. We suggest you start at the HI setting for the first use and then adjust down to your personal comfort level. To receive the most pleasure from your warming product, read your User Manual. Weve designed a safe and incredibly plush electric blanket that is probably one of the softest warming blankets you’ll ever have the luxury of snuggling up in. 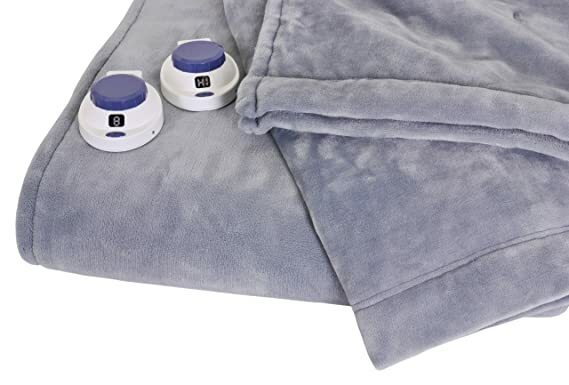 This electric blanket starts with ultra-soft micro-fleece fabric that is refreshingly smooth next to your skin for the ultimate in luxurious comfort and style. Constructed within the blanket is the patented Safe & Warm low-voltage technology. This low-voltage blanket includes a small power supply box that changes 120 volt AC home current into non-hazardous low voltage DC current (very similar to a battery) to provide warmth, protection and safety even if the blanket becomes wet. Unlike other warming blankets with their thick bulky wires, the wires in the Soft Heat blankets are so small and thin; they are virtually unnoticeable. During construction we place the thin wires 3-inches apart and evenly distribute them from head to toe. The benefit to you is a blanket that gives more of an even heat and all over penetrating warmth with no annoying hot or cold spots. 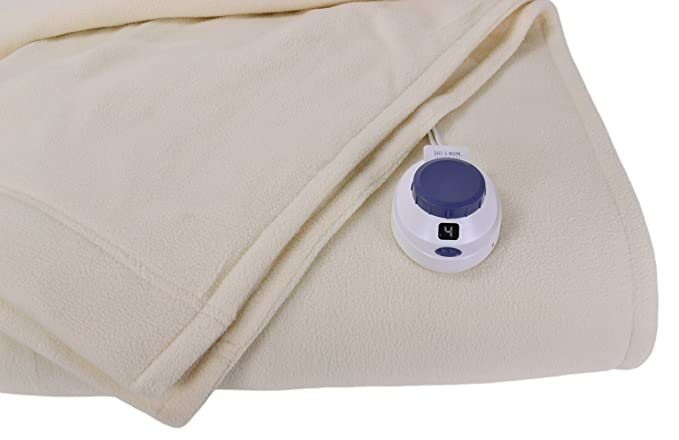 The twin size blanket comes standard with one easy to read, easy to turn, non-slip computerized controller to adjust the temperature of the blanket. A giant backlit display with auto dimming feature provides more convenience for night time adjustments with out having to turn on the lights. It has an automatic pre-heat and hold feature that makes sure that your bed is warm and cozy before you climb in for the night. You simply turn it on and the blanket will warm up on HI until it reaches the temperature that you pre set your dial on and then adjusts itself to hold it there. For your safety, convenience and power conservation it has an automatic shut off feature that will shut the blanket off after 10 hours just in case you forget. It also comes standard with built in over-temperature protection for that extra bit of safety and peace of mind.This warming product has been designed to provide you a gentle relaxing heat. It will NOT feel warm to the touch of your hand, even on the highest (HI) setting.You must actually use it to experience the cozy warmth that it will generate.If the control lamp is lit, it is working. We suggest you start at the HI setting for the first use and then adjust down to your personal comfort level. To receive the most pleasure from your warming product, read your User Manual.This warming product has been designed to provide you a gentle relaxing heat. It will NOT feel warm to the touch of your hand, even on the highest (HI) setting.You must actually use it to experience the cozy warmth that it will generate.If the control lamp is lit, it is working. We suggest you start at the HI setting for the first use and then adjust down to your personal comfort level. To receive the most pleasure from your warming product, read your User Manual. Weve designed a safe and incredibly soft electric blanket that is probably one of the most comfortable blankets you’ll ever have the luxury of snuggling up in. 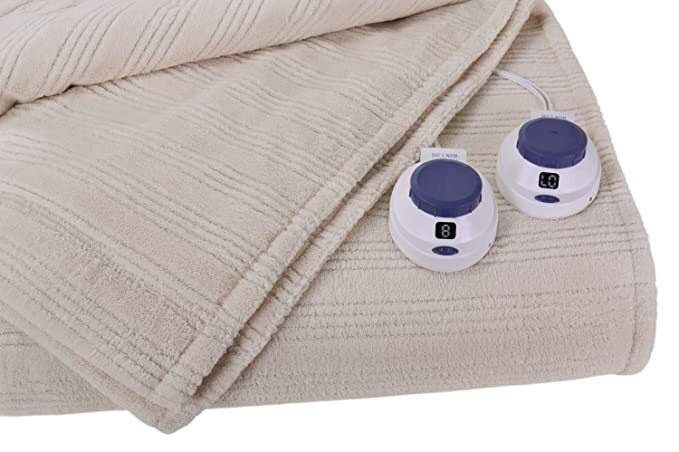 This electric blanket starts with super soft micro-plush fabric and decorative triple-ribbed design that is refreshingly smooth next to your skin for the ultimate in luxurious comfort. Constructed within the blanket is the patented Safe & Warm low-voltage technology. This low-voltage blanket includes a small power supply box that changes 120 volt AC home current into non-hazardous low voltage DC current (very similar to a battery) to provide warmth, protection and safety even if the blanket becomes wet. Unlike other warming blankets with their thick bulky wires, the wires in the Soft Heat blankets are so small and thin; they are virtually unnoticeable. During construction we place the thin wires 3-inches apart and evenly distribute them from head to toe. The benefit to you is a blanket that gives more of an even heat and all over penetrating warmth with no annoying hot or cold spots. The king size blanket is divided in two separate zones and comes standard with two easy to read, easy to turn, non-slip computerized controllers to adjust the temperature of each side of the bed giving individual comfort and control. A giant backlit display with auto dimming feature provides more convenience for night time adjustments without having to turn on the lights. It has an automatic pre-heat and hold feature that makes sure that your bed is warm and cozy before you climb in for the night. You simply turn it on and the blanket will warm up on HI until it reaches the temperature that you preset your dial on and then adjusts itself to hold it there. For your safety, convenience and power conservation it has an automatic shut off feature that will shut the blanket off after 10 hours just in case you forget. It also comes standard with built in over-temperature protection for that extra bit of safety and peace of mind.This warming product has been designed to provide you a gentle relaxing heat. It will NOT feel warm to the touch of your hand, even on the highest (HI) setting.You must actually use it to experience the cozy warmth that it will generate.If the control lamp is lit, it is working. We suggest you start at the HI setting for the first use and then adjust down to your personal comfort level. To receive the most pleasure from your warming product, read your User Manual.This warming product has been designed to provide you a gentle relaxing heat. It will NOT feel warm to the touch of your hand, even on the highest (HI) setting.You must actually use it to experience the cozy warmth that it will generate.If the control lamp is lit, it is working. We suggest you start at the HI setting for the first use and then adjust down to your personal comfort level. To receive the most pleasure from your warming product, read your User Manual. 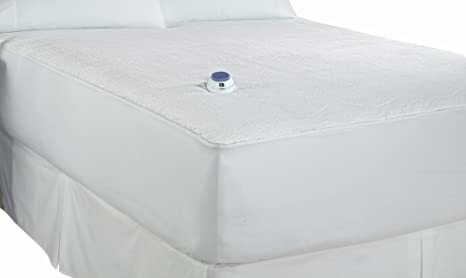 Weve designed a safe and amazingly soft electric mattress pad that not only warms your bed, but also protects it. The waterproof 233 thread-count 80 poly/20 cotton dobby stripe decorative shell is incredibly soft and soothing. A special TPU Laminate waterproof barrier and Stain Repellent Scotchgard Finish protects against spills and accidents of ALL types, but that’s just a couple of the wonderful features of this pad. Constructed within the pad is the patented Safe & Warm low-voltage technology. This low-voltage mattress pad includes a small power supply box that changes 120 volt AC home current into non-hazardous low voltage DC current (very similar to a battery) to provide warmth, protection and safety even if the pad becomes wet. Unlike other warming pads with their thick bulky wires, the heating wires in the Soft Heat pads are so small, they are virtually unnoticeable. During construction we place the ultra thin wires 3-inches apart and evenly distribute them from head to toe. The benefit to you is a pad that gives more of an even heat and has no annoying hot or cold spots. The twin size pad comes standard with one easy to read, easy to turn, non-slip computerized controller to adjust the temperature of the pad. For cozy sheets before bed time, it has an automatic pre-heat and hold feature. You simply turn it on and the pad will warm up on HI until it reaches the temperature that you pre set your dial on, and then adjusts itself to hold it there. For your safety convenience and power conservation, it has an automatic shut off feature that will shut the pad off after 10 hours just in case you forget. It also comes standard with built in over-temperature protection for that extra bit of safety and peace of mind. On the controller, a giant backlit display with auto dimming feature provides more convenience for night time adjustments with out having to turn on the lights. A fitted skirt keeps it all in place. Easy care machine wash and tumble dry. Weve designed a safe and amazingly soft electric mattress pad that not only warms your bed, but also protects it. The waterproof 233 thread-count 80 poly/20 cotton dobby stripe decorative shell is incredibly soft and soothing. A special TPU Laminate waterproof barrier and Stain Repellent Scotchgard Finish protects against spills and accidents of ALL types, but that’s just a couple of the wonderful features of this pad. Constructed within the pad is the patented Safe & Warm low-voltage technology. This low-voltage mattress pad includes a small power supply box that changes 120 volt AC home current into non-hazardous low voltage DC current (very similar to a battery) to provide warmth, protection and safety even if the pad becomes wet. Unlike other warming pads with their thick bulky wires, the heating wires in the Soft Heat pads are so small, they are virtually unnoticeable. During construction we place the ultra thin wires 3-inches apart and evenly distribute them from head to toe. The benefit to you is a pad that gives more of an even heat and has no annoying hot or cold spots. The king size pad is divided in two separate zones and comes standard with two easy to read, easy to turn, non-slip computerized controllers to adjust the temperature of each side of the bed giving individual comfort and control. For cozy sheets before bed time, it has an automatic pre-heat and hold feature. You simply turn it on and the pad will warm up on HI until it reaches the temperature that you pre set your dial on, and then adjusts itself to hold it there. For your safety convenience and power conservation, it has an automatic shut off feature that will shut the pad off after 10 hours just in case you forget. It also comes standard with built in over-temperature protection for that extra bit of safety and peace of mind. On the controller, a giant backlit display with auto dimming feature provides more convenience for night time adjustments with out having to turn on the lights.